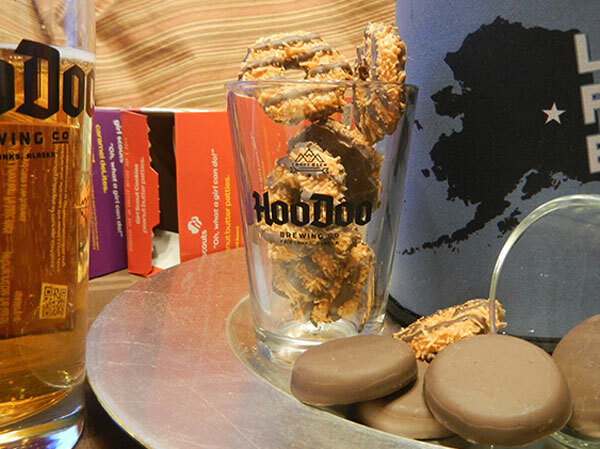 HooDoo Beer + Girl Scout Cookies = YUM! You are here: Home / Featured / HooDoo Beer + Girl Scout Cookies = YUM! It’s that time of year! It’s Girl Scout Cookie season! How can you resist those darlings in brown and green? And if you do, what’s your secret? Well, for those that live for this time of year (to help out a great cause, of course), we’ve created this handy beer pairing cheat sheet just for you [Research!]. When purchased locally, Girl Scout cookie sales stay in your community. With every box purchased you help girls build essential life skills and make a positive impact on their communities. So go ahead grab a sleeve and indulge again, and again, and again. Cookies taste better with beer. Together, the beer’s toasted malt and the cookie’s chocolate harmonize, while the coffee and mint invigorate your senses. Cookies coated in caramel, sprinkled with toasted coconut and striped with chocolate coating calls for the malty sweetness of the english Mild or the richness and vanilla, coffee depth that the Stout or Porter delivers. Cocoa and malt characteristics nod to the cookie’s chocolate coating and it’s vanilla-flavored framework are right at home with our Vanilla Porter, which is aged on 5 pounds of sticky Madagascar Vanilla Beans.. Butter, sugar, vanilla, flour. Traditional shortbread cookies are fairly straightforward so the Mild and the Barleywine don’t get in the way of that. Do-Si-Dos dance with the rich mouthfeel of Stout. It will make you wanna have 5, 6, 7 or 8. Citrus on citrus action. Yep, it’s hot. IPAs can be the perfect mate for a sugary treat as they tend to cut they cloying sweetness that is inherent with this lemon-flavored bomb of a wedge cookie. Grab a Barleywine or two with a sleeve of these and have an “I love you, Man” type of night. The Barleywine plays nicely with the dark fruit flavors of this cookie. The Mild’s caramel sweetness is a slam dunk – as in dunk that cookie into your pint. Go team! The earthiness of the Saison and BGS is the perfect pair for these crispy whole wheat morsels. Both of these beers have a subtle spice from the yeast that will love the bits of tangy cranberries and the zesty lemon kick. If you are eating this gluten-free cookie, just grab a glass of milk (cow, soy, almond, hemp – you decide). Or get crazy and have a Vanilla Porter, which will be nice with the oats, chocolate chips and peanut butter. Let us know what Cookies you like best with your beer. The best part is experimenting, so nibble and sip in the name of research. PROST!